With 2017 fast approaching we've listed our Top 10 certifications that will best equip you with the skills you need. This list covers certifications that range across various technologies and develop different skills such as security, networking, project management and cloud. A recent report from recruitment firm Robert Half found that 77% of UK Chief Information Officers (CIO) believe that ‘they will face more security threats in the next five years because of a shortage of IT security talent’. (ISC)²’s CISSP certification is the gold standard for IT professionals in managerial and technical security roles. This certification proves your competence, skills, experience and credibility to design, engineer, implement and manage information security programmes. The Information Commissioner’s Office (ICO) recently identified that cyber security breaches increased 88% since the beginning of 2015. So, it’s unsurprising businesses are looking to bolster their security policies and defence by employing those certified at the highest level. As a result, we’re positive that CISSP will continue to be an excellent path to reach the top security roles in this industry. EC-Council’s Certified Ethical Hacker certification prepares you to identify weaknesses or vulnerabilities within a business’ network. The difference is that rather than exploit these security gaps, you use these skills to protect a business and patch any potential vulnerabilities. EC-Council has dedicated thousands of hours to researching the latest trends and covert techniques used by the underground community to come up with the CEH Version 9 exam and curriculum. This certification will continue to gain popularity in the IT industry. Recent large-scale hacks with the likes of Yahoo, Tesco, Netflix, Reddit and TalkTalk prove the need for better cyber security skills. Cisco’s CCNA (Routing and Switching) certification teaches you the skills for network support positions and is the starting point for many successful careers in networking. The UK skills shortage means that demand for professionals with a certification in networking will continue to grow. A Cisco report found that in 2015 there was a shortage of 1.2 million professionals skilled in IP networking – with the number expected to grow in the coming years. This certification acts as a solid foundation to any networking career, so it’s certainly one to target in 2017! Thousands of companies now use The Open Group Architecture Framework (TOGAF) and as a result, the demand for those certified and familiar with the TOGAF framework has continued to grow throughout 2016. Skills and knowledge in the Architecture Development Method (ADM), The Enterprise Continuum and the TOGAF Resource Base can help you get a better return from your IT operations, helping things run faster, cheaper and reducing risk. One of Microsoft’s latest certification additions is this MCSE: Cloud Platform and Infrastructure, which develops your expertise in Microsoft’s cloud-related technologies and managing a modern data centre. With a wide range of electives to choose from to get this certification, it’s one that will unquestionably be held by a knowledgeable, expert group of professionals. Microsoft’s recent drive in Azure computing, with an investment of $3 billion in Europe data centres, means the Azure route will likely be one that experiences high levels of interest. Similarly, the need to offer greater security to business networks means the Securing Windows Server route will be equally popular in 2017. Microsoft recently streamlined their technical certifications, so if you aren’t already familiar with the changes, check them out here. Launched this year, the Certified Network Defender certification is expected to follow the CEH in becoming one of EC-Council’s most demanded products. 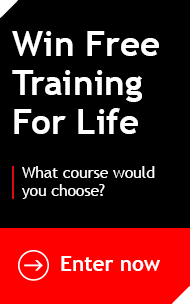 Developing skills in network security controls, protocols and devices, risk and vulnerability assessments and choosing appropriate firewall solutions, you’ll act as the first responder to any network security incidents. As business environments increasingly adopt Cloud technologies and Bring Your Own Device (BYOD) becomes commonplace, businesses need to improve their network security. First responders are crucial in this respect and have the potential to significantly mitigate damages following a security breach. 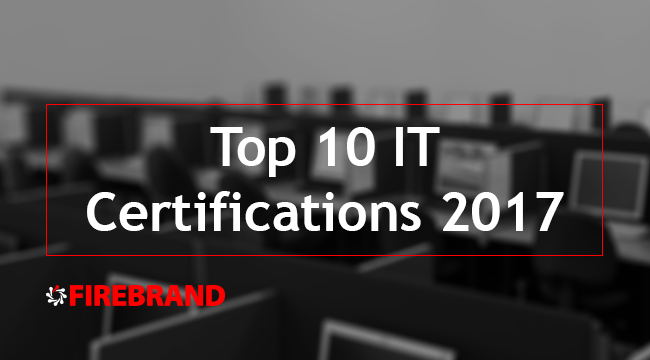 This certification comfortably makes the Top 10 list and should definitely be a cert you keep your eyes on! Another one of Microsoft’s new certifications is the MCSA: Windows Server 2016, which develops the fundamental skills needed to develop and manage your Windows Server environment. Windows Server is a robust technology that consistently experiences steady demand and is highly valued within the IT industry. This certification is an excellent place to learn the skills to install, upgrade and migrate servers, configure Nano Servers and manage advanced AD DS infrastructure. This certification is also a stepping stone to the MCSE: Cloud Platform and Infrastructure, which this certification acts as a prerequisite for. The PRINCE2 Foundation and Practitioner certification covers the basic methodology and terminology of PRINCE2. 2016 saw an increased demand for project managers because of the growing scale and complexity of projects being undertaken today. Demand is so large that it’s expected 15.7 million new project managers will be needed across the globe by 2020. The skills you’ll learn will ensure projects have a common and consistent approach, regular reviews or progress against plans and the assurance that projects must have a business justification. This certification is also increasingly demanded because of its relevance across industries. Unlike many technical certifications, it can be applied across the board. Those who hold the PRINCE2 certification are that much more employable. Firebrand is the only provider to offer both the Foundation and Practitioner course in just three days; Firebrand has certified over 1,500 students. Learn to create and implement modern web applications as well as develop the skills to build a modern mobile and web applications service with the new MCSD: App Builder certification. A study by Gartner found that the market demand for mobile app development will grow at least five times faster than internal IT organisations’ capacity to deliver them. The MCSD: App Builder is the top certification for developing the skills to design and implement application architecture, security and user experience. We’re confident that demand for this certification will skyrocket in 2017. CompTIA’s Security+ certification develops the skills to troubleshoot security events and incidents and operate within applicable policies, laws and regulations. This certification is vendor-neutral and is developed with the input from industry, government, academia and front-line practitioners. This means you can be sure it’s content reflects the current needs of the industry. That’s why this certification will continue to perform outstandingly in 2017. Key topics covered include network security, threats and vulnerabilities and application, data and host security. Firebrand is a CompTIA platinum partner so you’ll benefit from the highest level instructors and the most up-to-date curriculum.